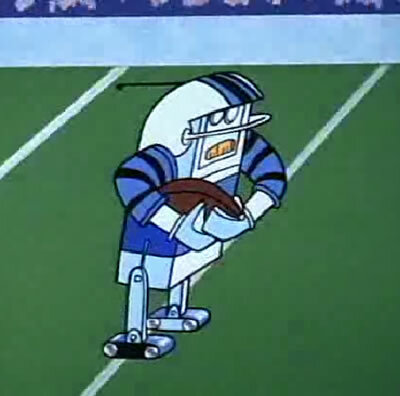 "I'm not sure if this counts as an sfnal reference, but I remember seeing football-playing robots in a 1962 episode of The Jetsons - The Jetson's Night Out. "Isn't steampunk over yet? When do we get our enthusiasm for the actual future back?" "Back in 1950, Frank Hampson designed a gyorpcosic jet-propelled Jeep for his hero, Dan Dare, which ran on a single ball just like this robot. The robot must have some kind of gyroscope inside it for balance.I couldn't find a good picture on the net, but if you have a reprint (or original) of the Eagle comics, it can be seen in the first two issues, from April 1950."